Gerald Cooke in England and Lance Pymble in Australia have kindly provided much of the following information. The Pymble (or Pimble) family lived on the Llanfrother Manor estate in Herefordshire [51°57'17.50"N, 2°40'56"W] from the mid-nineteenth century, or earlier (they had certainly been in the Hentland area for much longer), until after 1901, initially as labourers; by 1861 Thomas Pymble was able to buy the farm estates and cottages. He sold the property in 1899 but his son was still living there at the 1901 census. John (Ballingham 3 July 1748). The above son Philip Pymble (b. 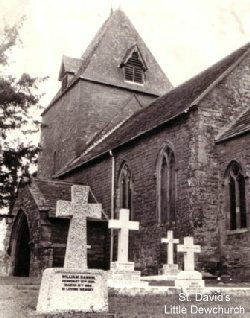 16 Dec 1739 Ballingham - d. 2 Feb 1814 Hentland, Herefordshire), illiterate labourer, on 26 Sep 1771 at St. Michael Church, Gloucester, married a Mary Watkins (b. 1744 Gloucester d. 12 Mar 1801 Hentland, Herefordshire). Will of Philip Pymble of Hentland, labourer, dated 1 Feb 1814, probate granted 15 Sep 1814 to Philip Pymble of Hoarwithy, HEF. Legatees: His children ie Hannah, Philip, Robert, Mary, Ann, Jane, William & Alice. All receive equal shares in all goods, personal & real estate with the exception of the house where son Philip lives which is not to be regarded as part of the estate. Executors: sons Philip & William. Testator signed with a mark "x". Witnesses William Griffith, clerk (s), Wm Bick (s), Esther Williams (s). Under £100. Hannah 22 Nov 1772 James Key. Witnesses brother and sister-in-law Robert & Mary Pymble. 1846 JK was London associate of Uncle Robert Pymble and was witness at marriage of Susanna Pymble and J.H. Lister. 18 May 1803 27 Aug 1832 The author's great-great-great-great-grandfather. 7 children chr. London 1861 Migrated to Australia in 1821 after birth of 7th child and after having all 7 baptised at Whitechapel. 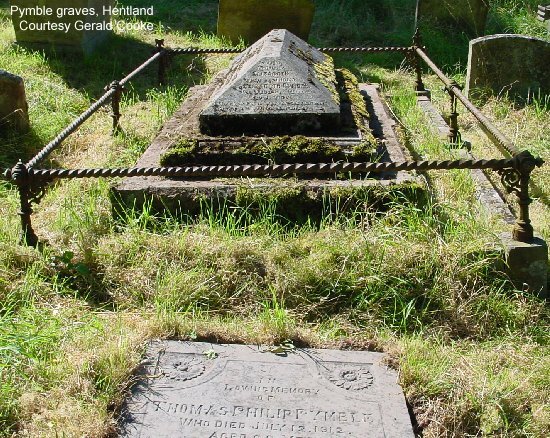 In 1823 Mary died and was one of the first to be buried in St. John's churchyard at Parramatta. Robert and his children moved in 1826 onto a land grant which later became the fashionable suburb of Pymble on Sydney's Upper North Shore. Lance Pymble states: "Robert Pymble appears to have had several associates in London with whom he applied for leave to travel to NSW in 1820. One of these was James Key who married Hannah Pymble and I believe was a witness to the marriage of Susanna P. and J.H. Lister. Another was Richard Sadler, married to Sarah Key, whom Robert refers to as his "brother-in-law" but was actually his brother-in-law's brother-in-law. Robert's petition was for land in the Bathurst district which Sadler and Pymble had picked out in the mid 1820s. Another associate of Richard Sadler and James Key was Anthony Horden of the well-known Sydney department store. Richard Sadler and Robert McIntosh seem to have had an interest in an inn called the Bull's Head Inn which is now the site of the Hilton Hotel and the McIntoshs were in court over the title to this land in the late 1880's." 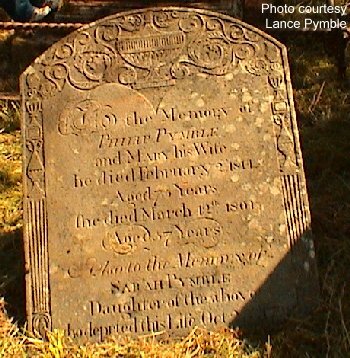 11 children - Said to have visited Sydney when her sister-in-law Mary Jenison Pymble died. Jane 13 Mar 1785 George Moore. Jane's siblings Hannah and William were witnesses. - Had 47 acres of market gardens at Greenwich employing 10 men & 5 women. William 17 June 1787 Unmarried - Was a lodger at a pub with the name of "The Bride & Bridegroom", Whitechapel? Mary chr. 26 Feb 1804, Hentland 1835 to Charles Hook, cooper (later grocer) 1845 Father's will provided for upkeep of her illegitimate daughter Susannah Penner b. 1828. This must be the Susannah, 13, dressmaker, in the Hook household in Broad St., Hereford, at 1841 census. There are also 2 Hook children, Jane aged 5 and Charles Wesley (2) and Elizabeth Lister, 8, was staying with them. Another daughter Ann Mary b. 1841. A Jabez Philip Hook was born and died 3Q 1845; his death is recorded on the same page as Mary Hook's, so it seems likely that Mary died in childbirth and the child died too. Jane (1836-1909) never married, took over the grocery shop. Charles Wesley married and had own grocery and descendants. Ann Mary m. William Parlby, 4 children. Susannah Penner went off to London. After Mary's death, Charles Hook m. Charlotte Pritchard in 1845. She d. and he m. Mary Roberts in 1854 - she was Welsh so Charles moved to Wales as a Methodist preacher leaving Jane to run the grocer's shop. near Orange NSW The author's great-great-grandmother. See story under Captain Lister and also Margaret Hardwick's story of her life. A daughter Elizabeth was b. 1842 d. 1888 1888? Bought Llanfrother Manor in 1861 and sold it in 1899. At the 1861 census, Lister Baynes, son of Elizabeth Lister (Captain Lister's sister) and of Henry Baynes was staying with Thomas Pymble at Llanfrother Manor, so there were multiple connections between the Lister and Pymble families. Widow of son Thomas Philip, Emma Wheeler Pymble, burned to death in housefire Jan 1937. Executors & trustees: Kedgwin Hoskins of Strickstenning, Herefordshire, Esquire & Theophilus Lane of the City of Hereford, Gent. 1. to pay any debts. 2. to divide the remainder into 2 equal moieties. Out of the 1st moiety, to invest £50. The interest is to be used for the support of Susannah Penner, the daughter of his daughter Mary Pymble. The capital is to be paid to Susannah at age 21 or marriage. The remainder of the 1st moiety is to be divided equally between any children he may have when they reach age 21 or marriage, whichever is sooner. The second moiety is to be invested to provide income for "my dear wife" (unnamed). W.E. Ball (s) Hereford, attorney, & Alfred Meredith (s) Hereford, his clerk. Probate granted 10 Jul 1833 to Theophilus Lane & 4 Dec 1833 to Kedgwin Hoskins.